A cube of polystyrene measuring 10 cm per side lies partially submerged in a large container of water. A 0.5 kg mass is placed on the block of polystyrene. What percentage of the block now remains above water? The water is poured out of the container and replaced with ethyl alcohol (density = 790 kg/m3). Will the block be able to remain partially submerged in this new fluid? Explain. Will the block be able to remain partially submerged in this new fluid with the 0.5 kg mass placed on top? Explain. Without using a container of water, explain how you could determine the density of the polystyrene mentioned above if the material instead were spherical. i) Yes, it will float, with 13% submerged. ii) Yes, it will float with 76% submerged. Use a scale to measure mass and a tape measure to measure circumference, then calculate the density. This is College Physics Answers with Shaun Dychko. We have a cube of polystyrene of side length ten centimeters. We have to find its density knowing that 90 percent of it is above the water when its floating which means ten percent of it is submerged. Now the Archimedes principle says that the buoyant force on this floating thing is going to equal the weight of the fluid that is displaced by it. 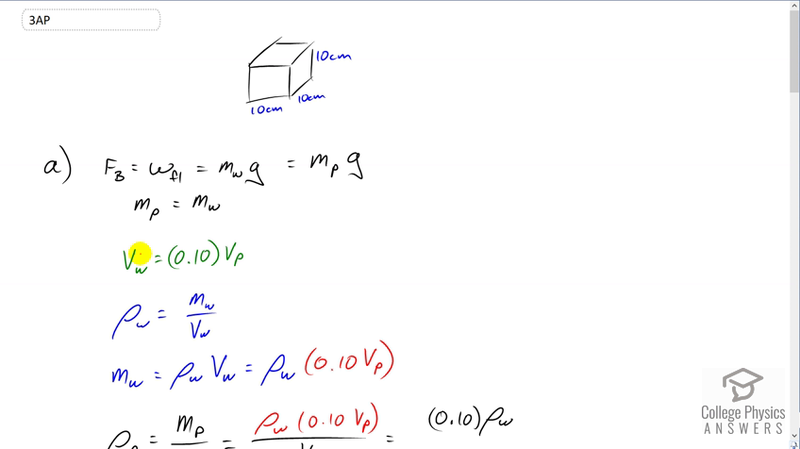 The fluid is water, and so the weight of the water displaced is going to be the mass of the water times g. Because it's floating, that's going to equal the weight of the block. So that's mass of the polystyrene times g. Now the g's cancel and we know that now that the mass of the polystyrene equals the mass of the water that it displaced when it's put in water. Now, we're going to figure out what this mass of water is in terms of volume because we know the volume of the water displaced equals ten percent of the volume of the cube because we're told that 90 percent of the cube is above the water so that means ten percent is in it. The density of water is the mass of water divided by its volume and we'll solve for m w by multiplying both sides by V w. We have mass of the water is density of water times volume of water and we have this expression for the volume of water in terms of the volume of the polystyrene. So we substitute 0.1 V p in place of V w. All of this gets substituted for m p which is mass of the polystyrene because we saw up here the mass of the polystyrene and the mass of the water were equal. So we substitute rho w times 0.1 times V p. Then that's divided by V p because we're calculating the density of the polystyrene here which is the question for part A. It works out to 0.1 times the density of water, so that's 0.1 times 1000 kilograms per cubic meter which is 100 kilograms per cubic meter. Then in part B, we're told that a five -- is it 0.5 or five? -- a 0.5 kilogram block is placed on top of the polystyrene, and what fraction will be above the water now? Before, there is 90 percent above the water and now with this block on top what fraction will be above the water now? So the buoyant force is the weight of the fluid displaced, Archimedes principle, because the thing is floating that's going to equal the weight of the thing, so that's the mass of the polystyrene plus the mass of the block, times g. So we have this expression now, mass of the water displaced is the total mass of the block and polystyrene, and density of water is this as we've seen before. We can solve this for V w by multiplying by V w over density of water and we get the volume of water displaced is mass of the water divided by density of water. That's going to equal the fraction of the block that is submerged, times the total volume of the block. So we're solving for b here, the fraction submerged because this amount by which it's submerged, this is the volume submerged, is going to equal the volume of water displaced. So we have b then after we divide both sides by V p here, is the mass of the water divided by density of water times V p. Now the mass of the water is mass of the polystyrene block plus the mass of the block. Then we substitute for mass of the polystyrene which is density of polystyrene times its volume, and then we can divide this denominator into both terms on the top here. We get the ratio of the densities of polystyrene to water plus the mass of the block divided by density of water times volume of the polystyrene. This works out to 100 kilograms per cubic meter divided by 1000 kilograms per cubic meter plus 0.5 kilograms, mass of the block, divided by 1000 kilograms per cubic meter times 0.1 meter cubed, this is the volume of the polystyrene, this works out to 0.6. So 60 percent of the polystyrene block is submerged which means the percent above is 100 minus 60 which is 40 percent. That's 40 percent of the block, polystyrene, is above the water. Then if the fluid was not water but instead ethyl alcohol, the fraction submerged is the ratio of the densities. I could have used that formula way up here but I felt like deriving it which is basically what we've done. You can see that here, the fraction submerged is the ratio of the densities of the fluid plus this. But you know if there is no block on top of that, our term is zero. So we have 100 kilograms per cubic meter divided by 790 which is 0.13. So the fraction submerged is 13 percent and yes, it will float. Then the fraction submerged with the block on top, we've created a formula for that here. So we'll just copy that and re-use it. So that's the fraction -- this is the density of polystyrene divided by that of ethyl alcohol, plus the mass of the block divided by the density of ethyl alcohol times the volume of the polystyrene. So that's 0.1266 plus 0.5 kilograms over 790 kilograms per cubic meter times 0.1 meter cubed. This gives 0.76. So yes it will float but with 76 percent submerged. Then part D says, what's an alternative way to calculate the density of this polystyrene if it was a sphere? So I would use a scale to measure its mass and then use a tape measure to measure its circumference and then calculate the density with that. So we know that density is mass over volume and the volume is four thirds pi r cubed. It's a bit difficult to measure the radius of a sphere though, so we're going to substitute that with circumference in a second. But this simplifies to three m over four pi r cubed. Circumference is two pi r and so that means radius is circumference divided by two pi and then we'll substitute that in for r. This works out to six pi squared m over circumference cubed. So I'd plug in the circumference into this formula and plug in mass and then that would get the density.